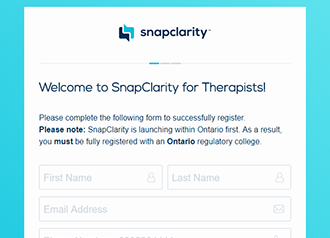 To begin providing therapy through Snapclarity, licensed therapists must complete the registration form on our website. This is a three-step form that collects contact information, your designation, your regulatory college or association registration number, and the name and registration number of your PhD supervisor (if required). Once submitted, our team will verify your information and schedule a call with one of our clinical consultants, if deemed necessary. The verification process can take anywhere from 1 day to a few weeks, depending on the volume of applicants at the time of your submission. If approved, you can expect a congratulatory email, and shortly after, another email with a link to the next steps to join the Snapclarity platform. Have you submitted an application and have yet to be verified? Extended wait times can happen due to higher than usual volume of applications. You can check with us regarding your application status by contacting us through the support form.